Should I get vaccinated before going on a trip to Southeast Asia? What kind of vaccines should I get? How much does it all cost? Trying to find the right answers to all of these questions can be difficult. The first thing to know is that choosing to get vaccinated is a personal decision that only you can make. Then once you've made that choice, realize that there is more than one right way to answer all of the questions above. In some countries (the US, in our case) getting vaccinated can cost you hundreds, if not thousands of dollars. And when you’re trying to keep costs to a minimum, this can be a huge hurdle to have to deal with. I've heard of cases where people simply skip out on vaccinations because of the outrageous costs. What if there was an alternative? 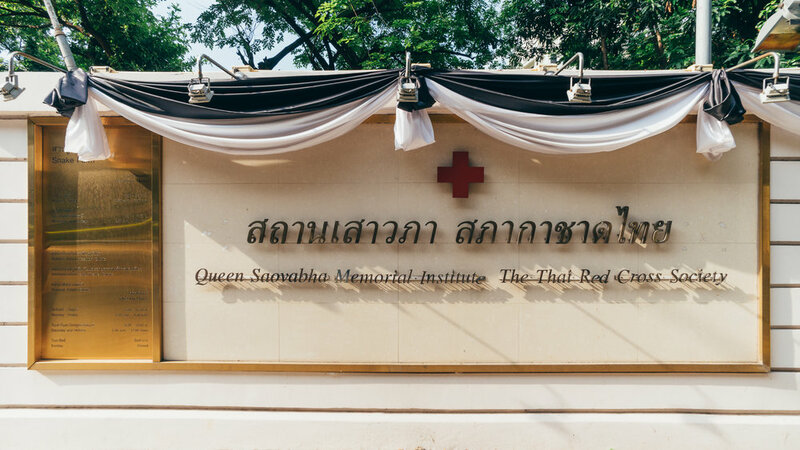 I didn't have to look much further than Bangkok to find the Queen Saovabha Memorial Institute, a travel and immunization clinic that was founded in 1913. 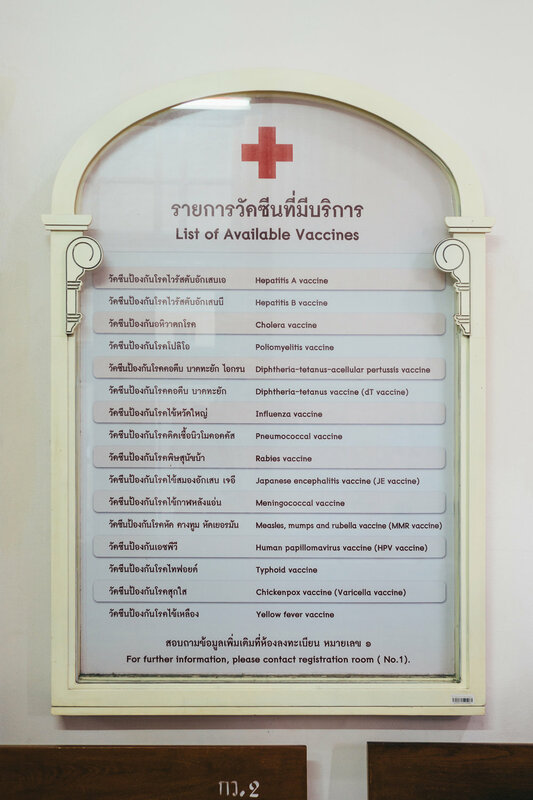 They’re also part of the Thai Red Cross Society and have all of the vaccines needed for Southeast Asia. Plus, they provide you with your international certificate of vaccination, which is useful if you travel to a country that requires a history of your previous vaccinations. It's a really simple process and you don't even need an appointment. Just show up to the Center during operating hours and go to room 1, where you will pay the registration fee (20 Baht), and be given the medical paperwork and plastic ID card that you will need to bring on future occasions. In the same room, they check your blood pressure and temperature. After that, you will go to the room in front of you (room 4), where you'll chat with the doctor for a few minutes about the vaccines that you want to get, and the ones he recommends. When you come to a conclusion on which vaccines you'd like to get, he stamps your certificate of vaccination with the shots you've chosen. Then, the nurses will give you a paper that you will have to take to the pharmacy next door (room 5), where you will be given the medicine; this is where you pay for it too. This whole process only takes a few minutes, regardless of how many people are waiting at the center – they're incredibly efficient. Finally, you go to room 4 again (where you spoke the doctor earlier), where you will be given your shots by the nurses present. That's it. After that, they only ask that you stay there a few minutes for any possible side effects you may have to the vaccines and then you're good to go. There is an ongoing debate on whether getting the rabies vaccine is necessary or not. You’ll read that if you’re not going to be exposed to animals or be in the middle of the jungle, it is not necessary to get immunized for rabies. In Southeast Asia, there are a lot spayed dogs and cats, as well as a ton of monkeys (some more friendly than others). In my opinion, getting the rabies vaccination is not an absolute requirement, especially if you’re only coming to certain cities for 2-3 weeks. In our case, however, we're planning on being in the area for a year and being in rural areas frequently – for our own peace of mind, we added it to our list of vaccinations. Now, if the dosages had been priced at almost $1,000 per person – we probably would’ve taken our chances, like so many others have. But given that the dosages were available in Thailand at these prices, we opted to get them. What’s the real difference? If any infected animal bites or scratches you, the person with pre-exposure treatment has a much easier time at the doctor than the person who hasn't gotten it. Essentially, those who haven’t gotten the rabies shots will have to get the entire 5-shot dosage of the vaccine and another shot called the Rabies Immune Globulin when you get your first dose (a nearly 30-day process! ); those who have gotten the shots only need to get the last 2 shots (on the day that you got bit and then on the third day). Check here for more information. All in all, getting the shots beforehand makes a troubling situation much easier to deal with and less time-consuming. There aren’t any vaccinations for this disease, but there are pills you can take beforehand. We decided not to take these pills because of the side effects they’re known to have over the time you take them, all while not actually immunizing you to the disease. Instead, we’ve prepared ourselves with anti-mosquito sprays and appropriate clothes for areas prone to having malaria-laden insects. So, should I get vaccinations or not? As I said previously, getting immunization is very much a personal choice, and one that depends on several variables. Before leaving on your next travel adventure, get information on your destination, consult your doctor, and if it is too expensive in your country, try to find alternative places to get vaccinated. If you play your cards right, you can get all of the vaccinations you need for next to nothing!